tags: An evil entombed for 2000 years... until now. An elite group of soldiers on a covert mission to retrieve a scientist from an underground lab encounter an ancient evil in the facility. A team of mercenaries under the command of hard-charging war veteran Mack (Gooding Jr.), are contracted by a mysterious CIA operative named Elissa (Cruz) to rescue a scientist (Perlman) working on an archeological discovery deep under the Middle Eastern desert. With the help of a mysterious priest (Rollins), Mack and his team soon discover the true secret of what lies beneath the sands. A secret that has been protected for thousands of years. 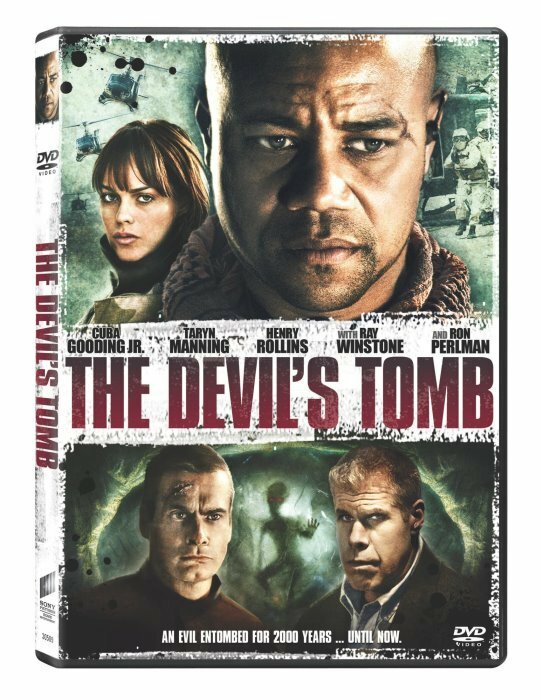 A secret that is not of this Earth The Devil's Tomb has a classic "B" cinema plot, and it counts on its cast with various actors of a medium caliber, something which is not usual on this kind of movies.That could indicate an excellent screenplay...or actors who sacrificed their dignity in order to win some money.The Devil's Tomb is somewhere in the middle of that...its screenplay is not very good, but it is not bad either, and the movie is not bad to say that the actors sacrificed their dignity.In summary, we are in presence of a mediocre but moderately entertaining horror film. On the previously mentioned cast, we have Cuba Gooding Jr., an Academy Award winning actor who sent his career to hell after participating on horrible comedies (like Boat Trip) and laughable dramas (like Radio); The Devil's Tomb is better than the movies he tends to participate, but that does not mean this film is very good.And, on the cast, we also have Ray Winstone, Ron Perlman, Taryn Manning and Bill Moseley.It was very weird for me to see them participating on a low-budget and straight-to-DVD horror film.The reason of that may be its director, Jason Connery (son of the famous Sean), making his first work as a director with material which is familiar to him, because he has participated as an actor on other straight-to-DVD horror films (like Brotherhood of Blood and Alone in the Dark 2).The main fail from The Devil's Tomb is that it has many clich辿s. Connery made a decent work, because he keeps a good rhythm and he created a few sequences which produce adequate atmosphere and suspense.Besides, the story may not be too original and, as I mentioned before, it has many clich辿s, but it is well structured more or less.I also appreciated the energy and enthusiasm shown on the performances. In conclusion, I will give a slight recommendation to this mediocre but moderately entertaining movie, although the final experience is forgettable.However, I cannot deny this movie ended up being a bit better than I expected. I don't know where to begin with this flick. Maybe here: Soldiers who don't at all act & move like trained soldiers, female soldiers with make-up on while in combat, some third rate CGI effects that I could do on my PC in fifteen minutes, and enough plot-holes and unexplained crap to lose count of fairly fast. In fairness, Cuba Gooding Jr. and Bill Mosely made the film ALMOST watchable. But those two alone couldn't save the horrid storyline, and the above-mentioned things. I tried very hard to get past some of the issues that I found with this film, but it was to no avail. After 48 minutes I found myself being thankful that I was more than half way into the film. I thought years ago (in the 80's) that low-end horror flicks couldn't get any more lame, but was DEAD WRONG. It is sad to see someone as talented as the Oscar winning Cuba Gooding taking roles in such ridiculous movies. I hope that his appearance in this one didn't ruin his career long-term.